Need help? How to choose the right parking permit? Knowing who is on your premises and whether or not they should be there is just as important outdoors as it is in. At Seton, we stock vehicle permits to control access to your outside space and indicate the length of time people can park there. We can also supply vehicle accessories designed to keep you and your employees safe when out on the road, including a variety of plates to mark vehicles carrying hazardous chemicals that increase safety in the event of an accident. Read our parking permits buying guide and frequently asked questions to find out more about selecting which permits to use and details of other ways to mark your vehicles. Our comprehensive range of vehicle permits is designed to provide you with a useful solution to keeping your car park secure regardless of the type of business you run. We stock several different kinds of vehicle permit that you can write on with marker pens, enabling you to use you own code or note the date and/or time. This means you can make sure they are not used on multiple occasions, unless they feature a staff designation. Some of our vehicle permits are custom designed, so they can also feature your company name, making them much more difficult to falsify. Using vehicle permits helps reduce overcrowding in your car park and will discourage people from leaving their cars there while they visit other local businesses. It can also help tighten up site security and keep track of who has permission to be in different areas. If you use distinctive permits, you will even be able to check them using security cameras so you will not need to patrol the car park as often to ensure it is being used appropriately. 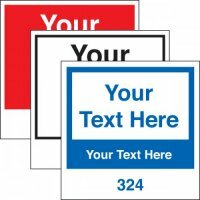 Our range of warning stickers can be used to let people know when they have parked in the wrong area. Often this is accidental and sending a clear message can stop it from happening again. 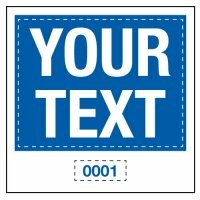 These stickers create a more authoritative impression than a handwritten notice or conversation. You can also use notices like this to warn people when you have had to take action in response to their illegal parking. When you are on the road, it is important people are aware of any dangerous materials you may be transporting. We stock various kinds of Hazchem plates, which are easy to attach to your vehicles, so that anybody assisting you in the event of an accident will be forewarned about risks. We also have other types of warning plates for use on your vehicles which reduce the risk of accidents due to things like dangerous overtaking, and make your vehicles easier to see when visibility is poor. Making sure your company vehicles are properly supplied means your employees will be in a better position to look after themselves if things go wrong, especially if they are travelling to remote locations or if have to deal with snow or ice. We stock a wide range of equipment for use in emergencies on the road, from hazard warning triangles and rope to first aid kits. Is it worth investing in parking permits with my company name, or should I just use generic ones? Using customised parking permits will allow for a greater level of control over how, when and where people can use your car park. As well as marking them with your company name to ensure visitors aren’t using permits from a neighbouring business, you can number them to keep track of how many you have given out and even mark them with bay numbers to ensure cars are in the right space. Seton manufacture, as well as supply, safety signs and other car park solutions so we can always tailor a product to your specific needs. I have been told my company needs to use Hazchem vehicle plates. What do these do? Hazchem vehicle plates are a simple way of alerting other people to the fact that your vehicle could contain something dangerous. This means that if you are involved in a crash, emergency services will know what they are dealing with. Why do I need to use a window label if I clamp a vehicle? Can people not just see the clamps? When a vehicle is clamped there are a set of strict rules around what can and can’t be done. One element that must be carried out fully is warning drivers that their vehicle has been immobilised. This has to be done correctly. A clearly visible window label is an excellent way of advising drivers that their vehicles might be damaged if they try to move it. Can I not buy emergency gear on the road when it’s needed? If you’re only buying equipment to deal with vehicular emergencies as they occur then you most likely aren’t fulfilling your responsibility to keep workers safe. When being used for work, cars and other vehicles should be treated as an extension of the office and the same safety standards will apply. Buying emergency supplies such as first aid kits and fire extinguishers in advance will ensure everything is in place before it is needed. All of the items sold by Seton conform to the latest safety standards so by shopping with us you can be certain you are meeting your obligations as an employer.